One thing that always sort of bums me out is how many trees get cut down for Christmas. But I love the smell of pine trees indoors around the holidays. so for the past few years I’ve made a sort of branch bundle out of extra discarded tree branches in lieu of a tree. This year as I was walking up the stairs to my apartment I happened upon some discarded branches in the hallway, leftover from someone’s tree installation. So I picked them up and decided to figure out how to make a wreath with as few additional supplies as possible. Because the origin of wreaths are with pagan holidays celebrating the changing seasons, life cycles and fertility, it is more in line with my values than the Christianized version. You can really be as inventive as you want with the look of your wreath, but mine is quite minimalist. 1. Forage for discarded tree branches, or if you live in a woodsy area, cut off a few branches from a tree. 2. Take the longest section of branch and loop it around itself to make a circle. Secure the two ends with a strong, thin string. 3. Loop some twine around the entirety of the circle as shown above. This will allow for you to add in additional pieces of pine to get a fuller look if you want. 4. Secure the twine so that it wrapped tightly, you do not want it to unravel. 5. 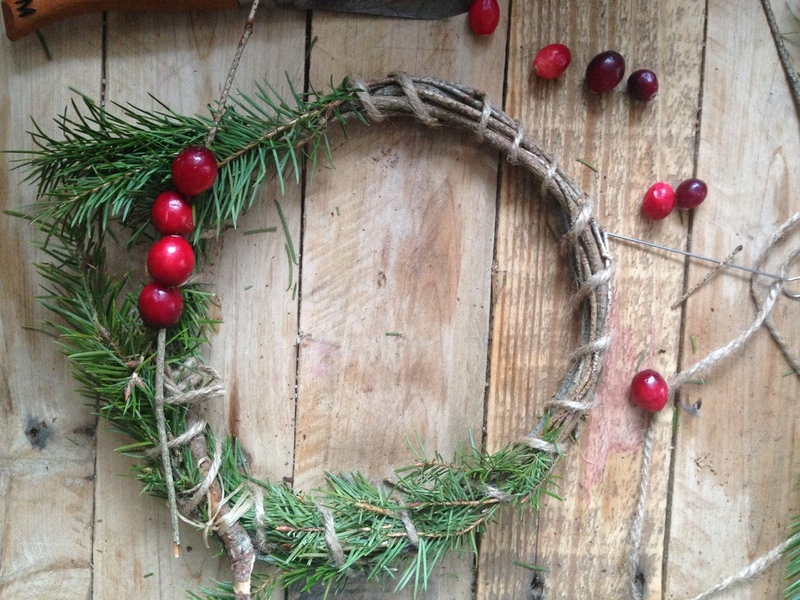 Tuck new pieces of pine around the ring, making sure to weave the entire branches through the wreath. Of you have other greens that you want to include in your wreath, now is the time to add them. 6. For a festive look, if you don’t have holly berries, cranberries are a great alternative. They will become a bit dry and shriveled after about a week but I think they still look cool. You can either thread them with a needle and thread and tie them onto your wreath, or skewer them onto a small twig (do this by puncturing the berries first, and then skewering them onto the twig. 7. Go over the additional pine or other greens that you added with one more loop of twine, and make sure to go over the twig with the cranberries as well so that all pieces are secure. Hang it on your door or wall or wear it as a crown as in the pagan holidays of yule and Saturnalia. There are endless ways to decorate your wreath - get creative! This section will give you some ideas on what kinds of seasonal dinners and crafts to make with your coven. All of the crafts use natural materials and are easily achievable in group settings. The recipes are seasonal and made from ethically sourced ingredients, and are easy to make for an after work dinner. Each of these crafts and recipes were made by the craft coven and we can answer any questions you might have as long as you leave a comment on the post. Sign up with your email address to receive monthly updates about crafts, the full moon, and upcoming events & classes. Thank you! To finalize your addition to the list, please log into your email and click confirm.